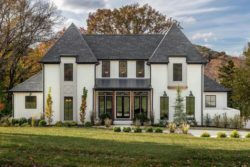 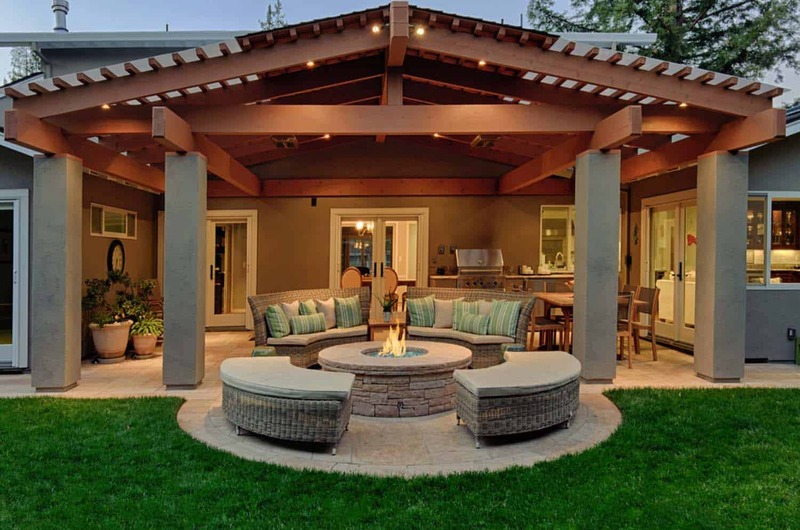 During the warm summer months you want to have a wonderful outdoor patio to enjoy entertaining family and friends and relax in comfort and style. 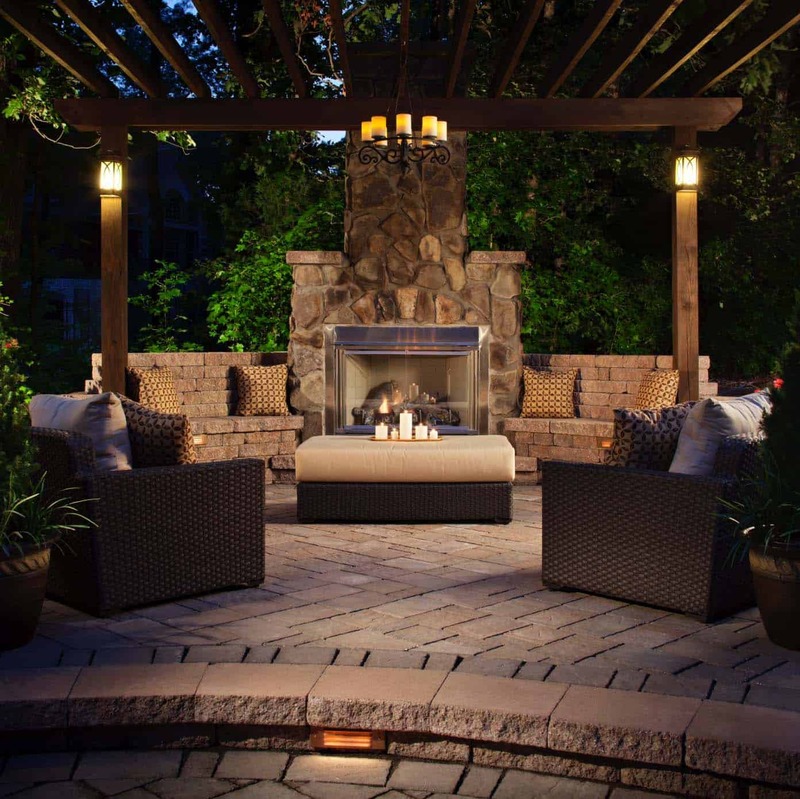 A traditionally styled outdoor living space is warm and inviting, with a more refined aesthetic in its furnishings, fabrics and finishes. 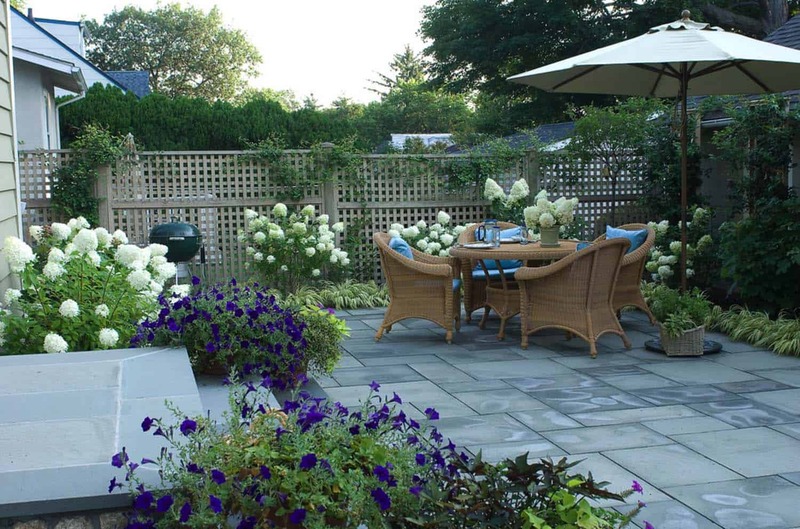 This style is very easy to live with and will be enjoyed by all who come to visit. 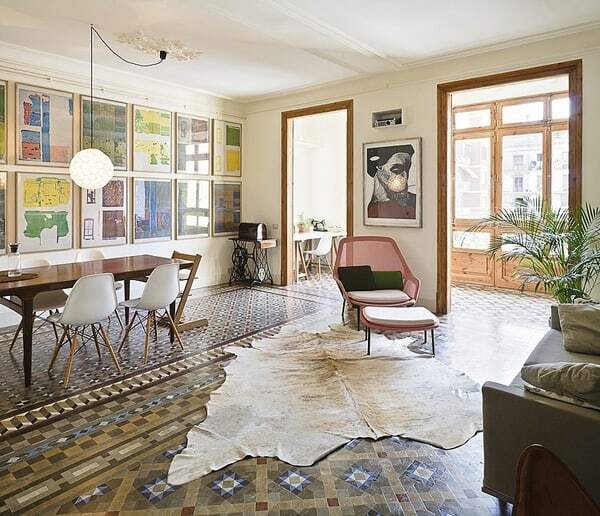 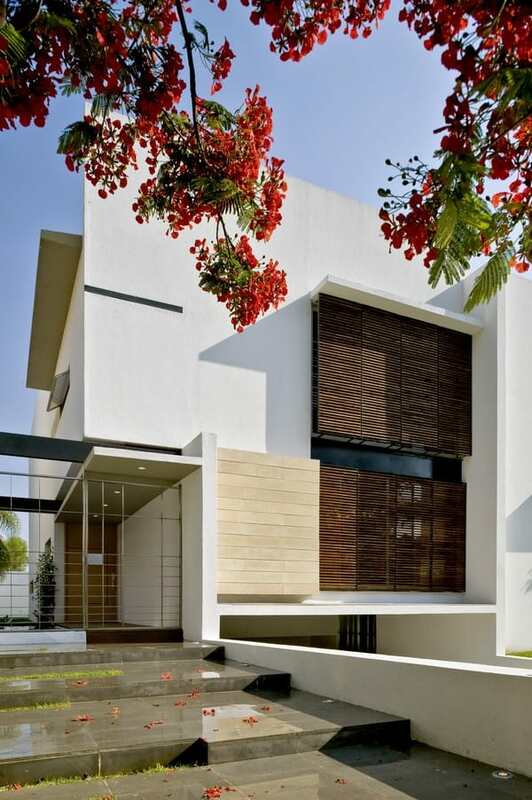 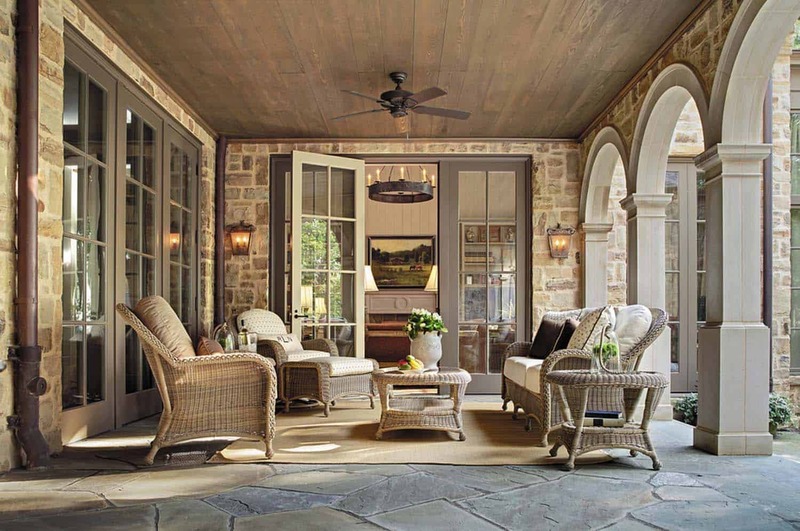 The traditional look is all about balance, from the architecture to the furniture placement. 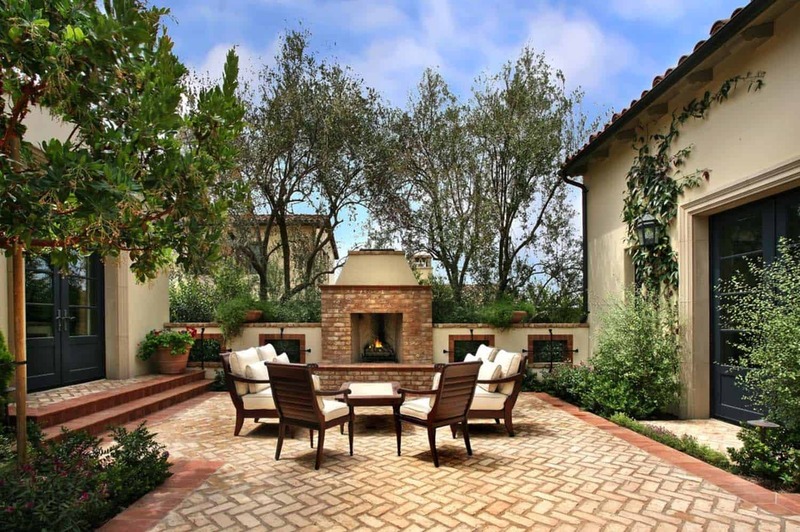 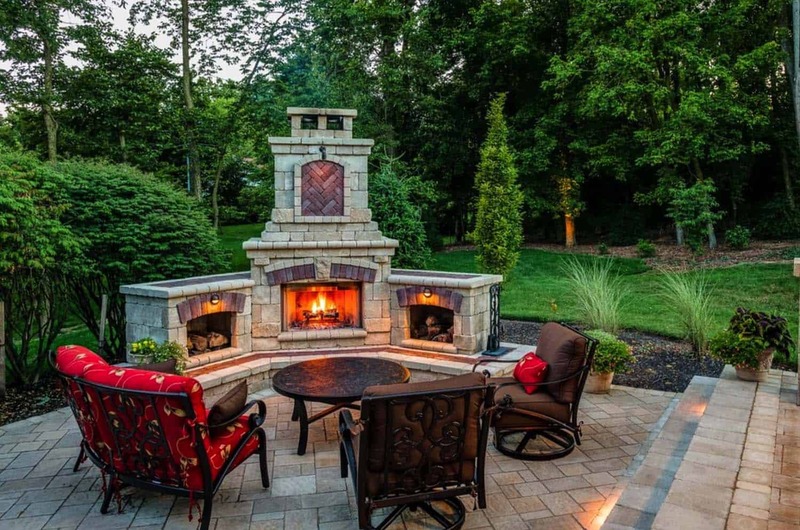 Everything is in perfect symmetry just like the beautiful outdoor space pictured above. 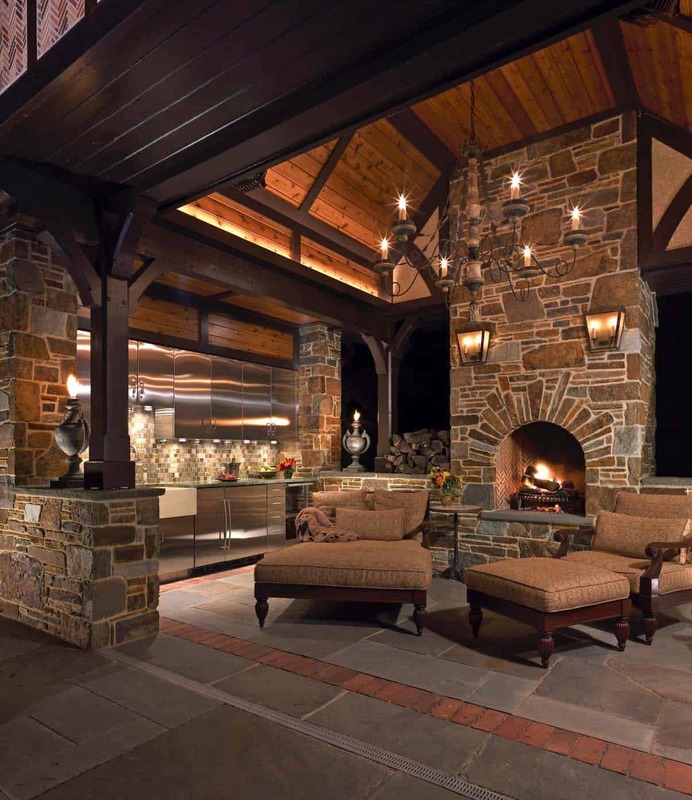 A home in Providence, Rhode Island (image above) features an outdoor seating wall surrounding a Pyzique fire pit. 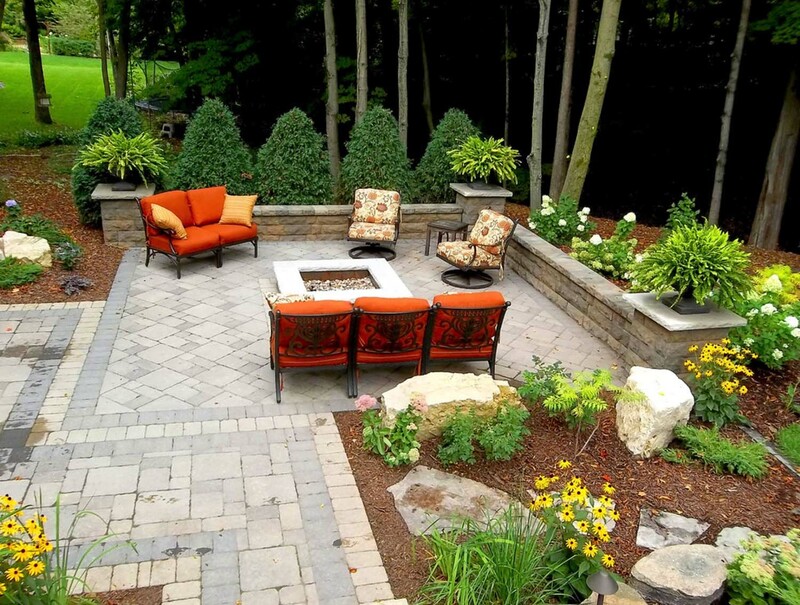 Your outdoor space should be filled with lush gardens, potted plants, anything that adds color. 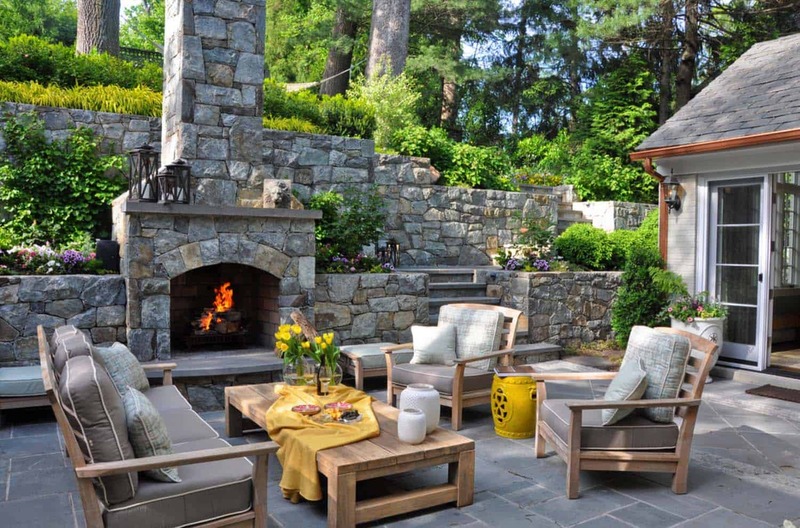 The idea is to create an outdoor oasis that you can enjoy spending time it, make it personal. 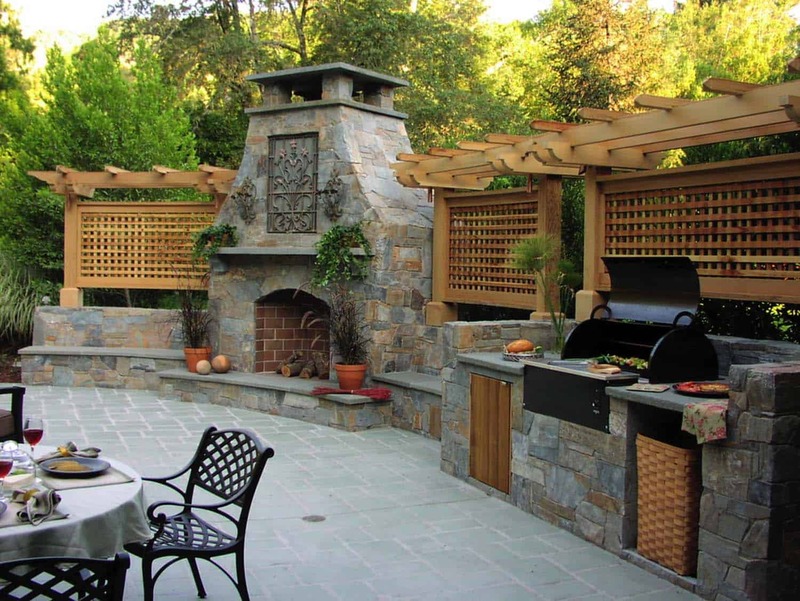 If you enjoy cooking, consider an outdoor cooking area, even if it is just a grill. 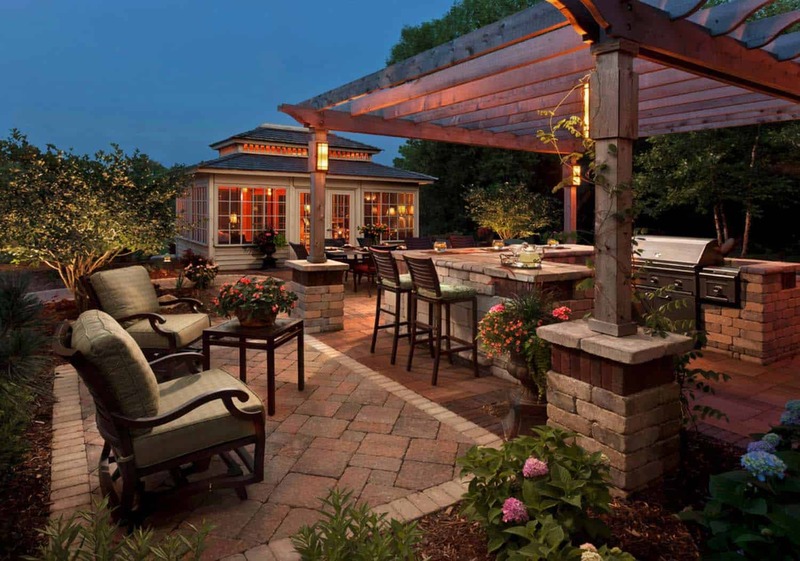 Dining al fresco is always a nice switch up from eating inside, there is nothing like enjoying the sunset or a starry sky. 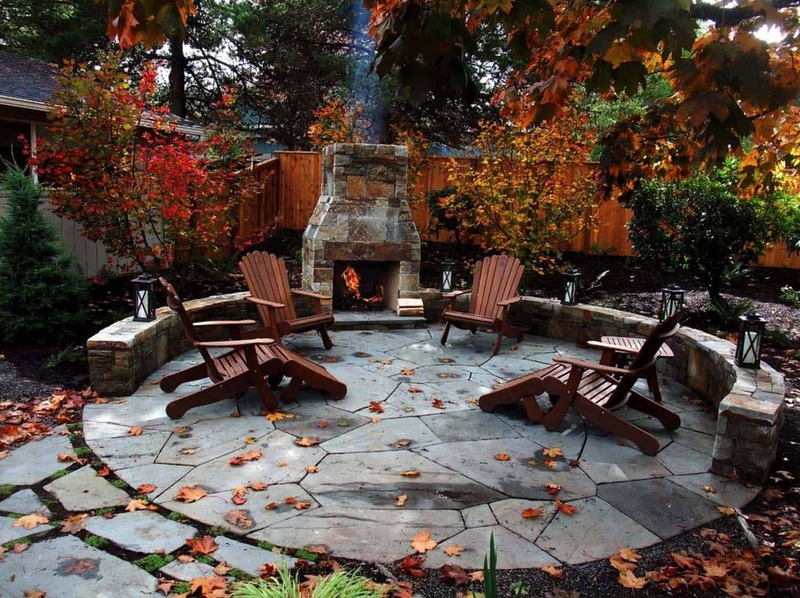 An outdoor fire pit is always a great addition to your traditional outdoor patio space. 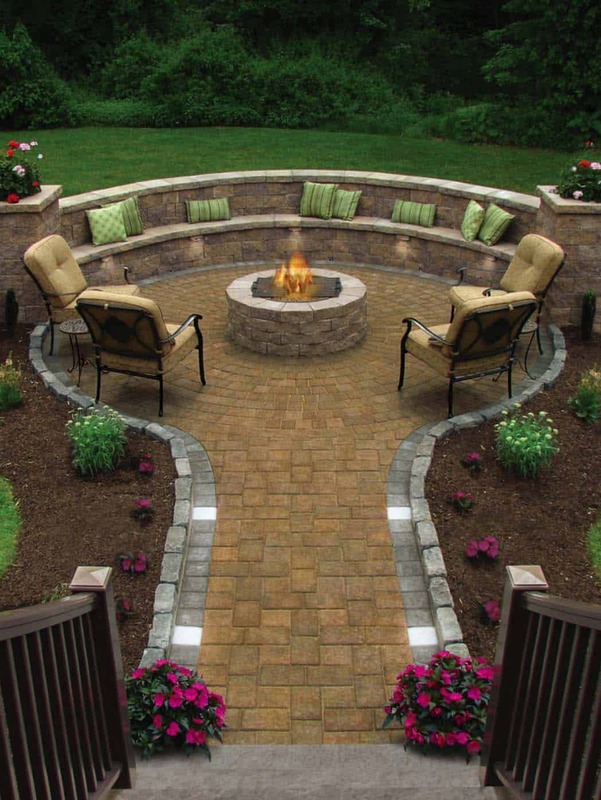 You can select a built-in or a movable one, which is handy if you have several seating areas. 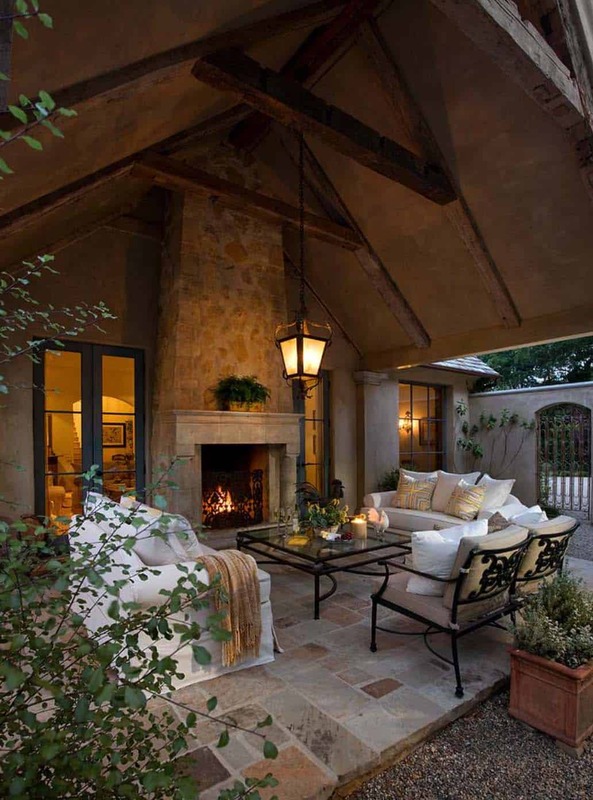 Candles are also an excellent way to add ambiance in the evening. 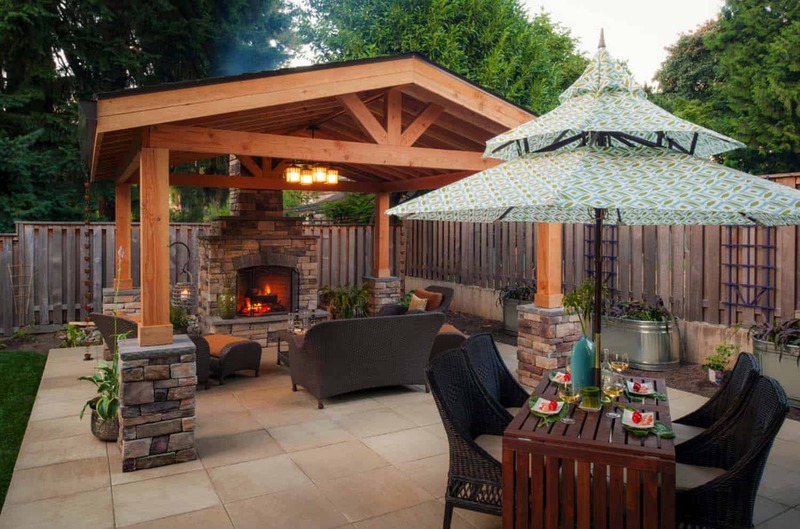 Your outdoor patio can be covered, hidden under a trellis, or just use an umbrella, there are so many options depending on your budget. 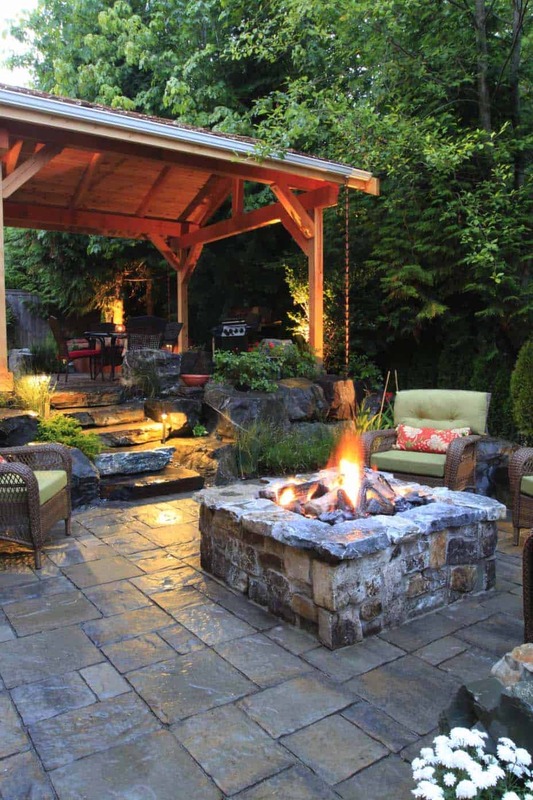 Optimally, a patio would be nice to use all year, but if you live in a snowy climate, then it is good to maximize your outdoor space as long as possible. 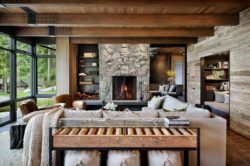 This may require an outdoor fireplace to keep warm, or space heaters. 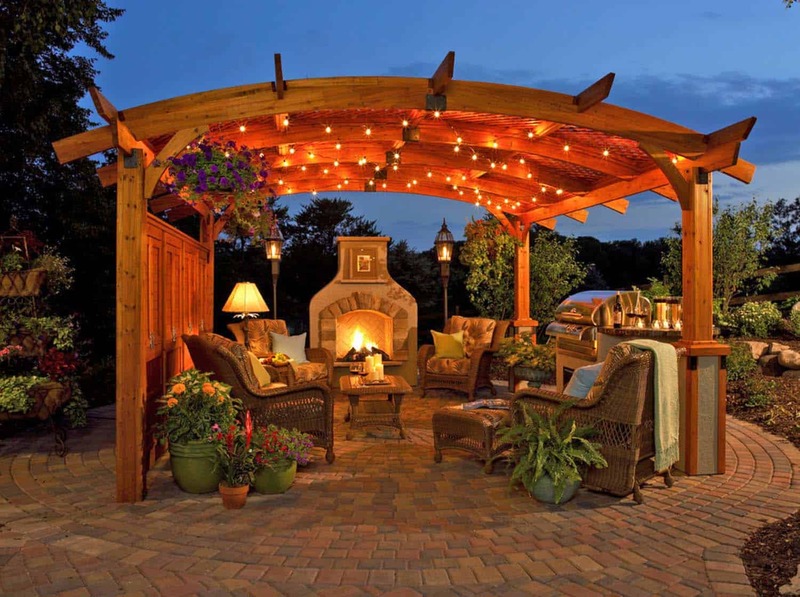 Below you will find a fabulous collection of various ways to decorate your traditional outdoor patio, enjoy and get inspired! 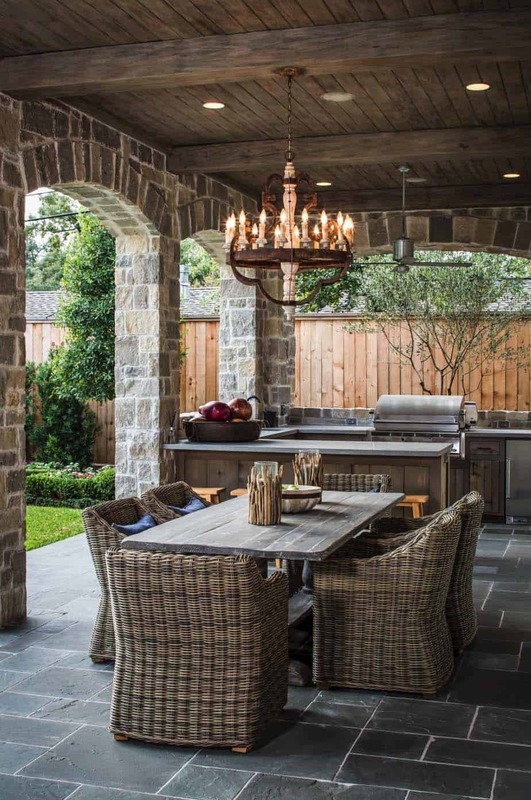 In the traditional outdoor patio above, a paver patio surrounds the pool area, the foundation for this spacious outdoor kitchen/dining area. 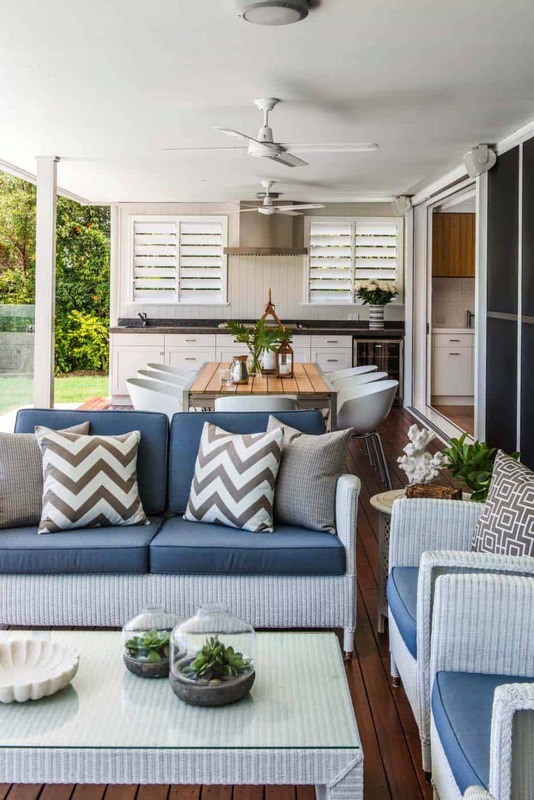 A sunken eating area creates a nice division of space between the diners and the chef. 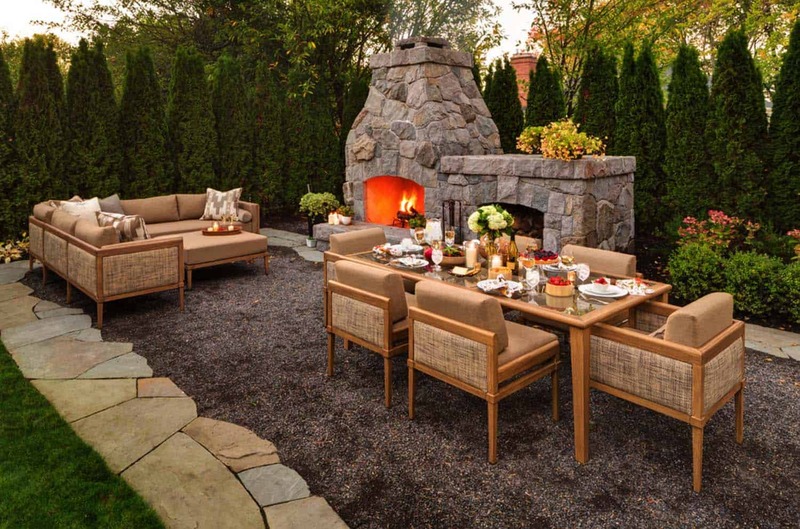 To keep the chef company, there is also plenty of seating spaces nearby. 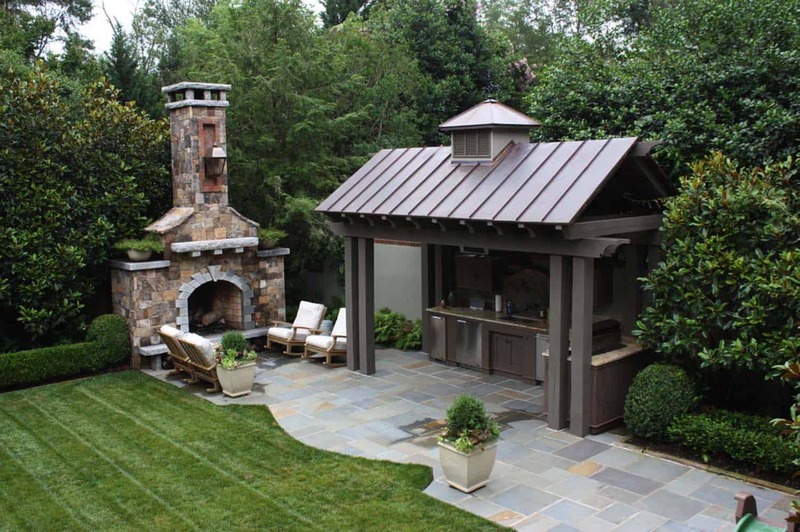 Custom detailing on the roof of the patio create a luxurious aesthetic. 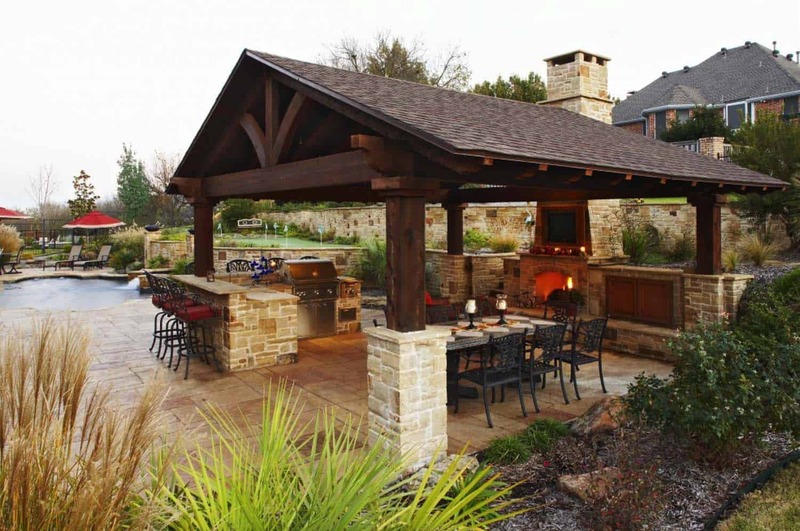 Want to see the rest of the home of the outdoor patio displayed above? 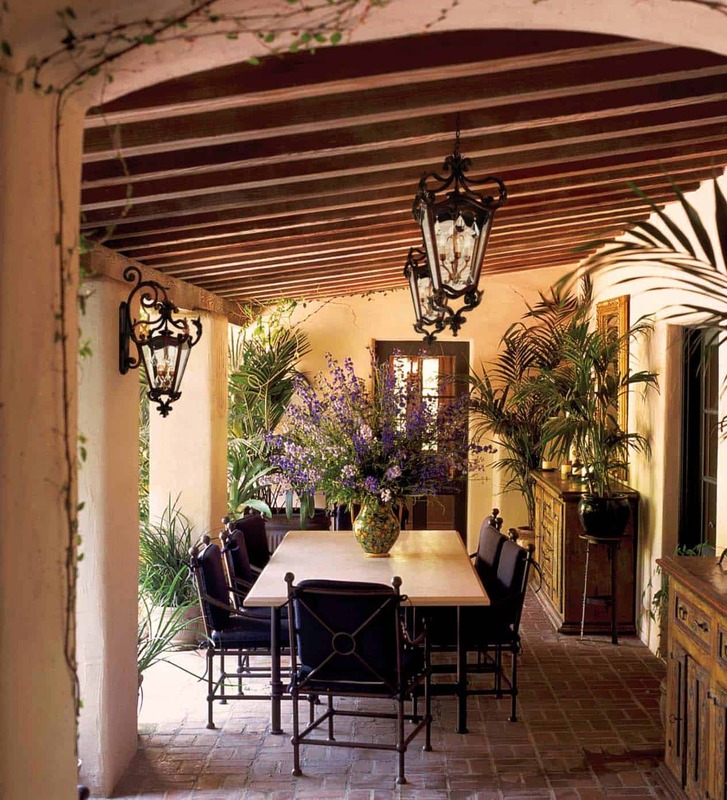 Have a look here: Mediterranean style Olive Mill Residence in California. 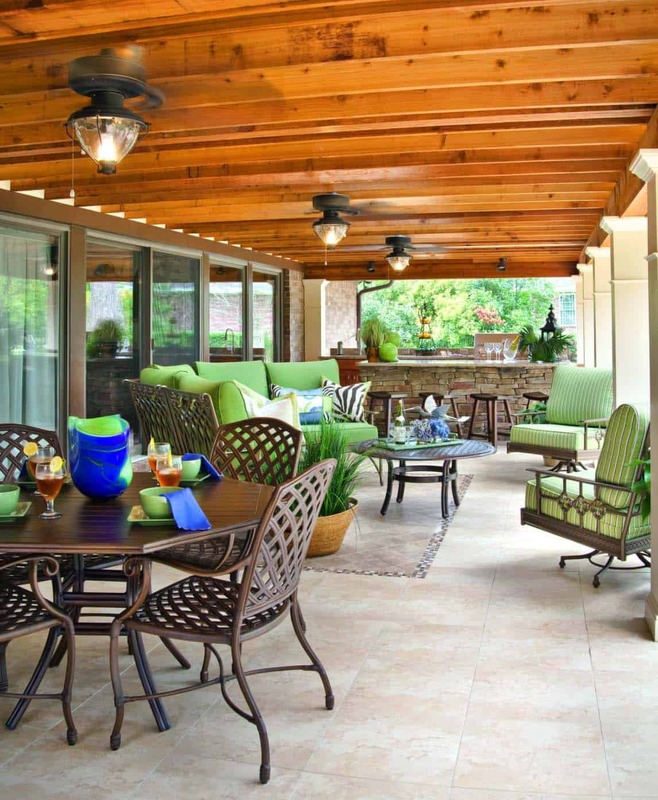 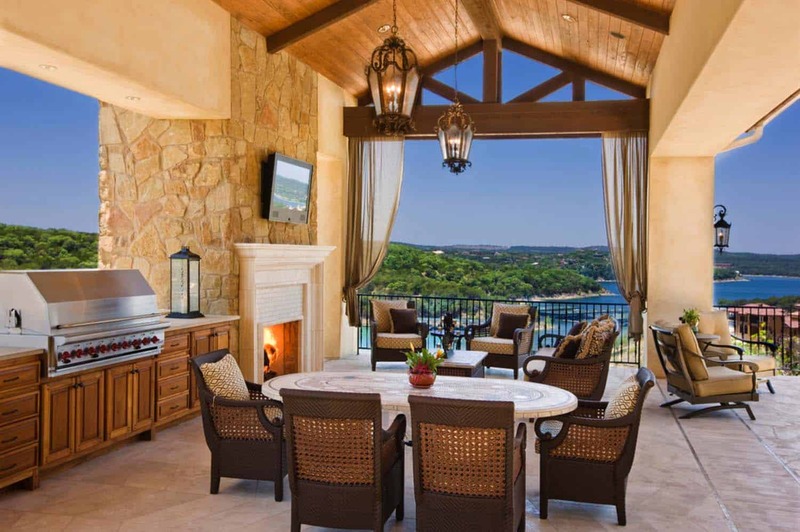 This outdoor patio pictured above is part of a home that was the recipient of five awards in the Rough Hollow Parade of Homes. 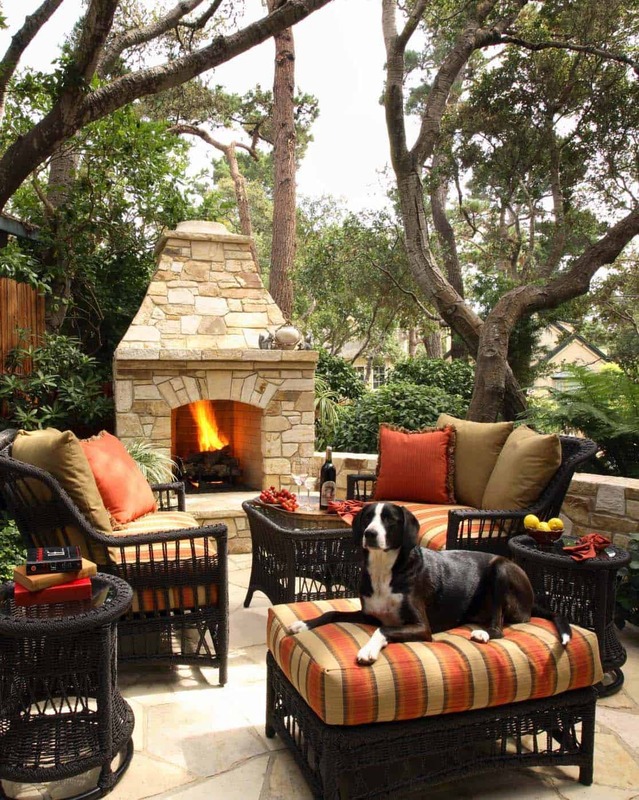 Have a look at the rest of the home tour featured here: Santa Barbara style home in Austin with an inviting design. 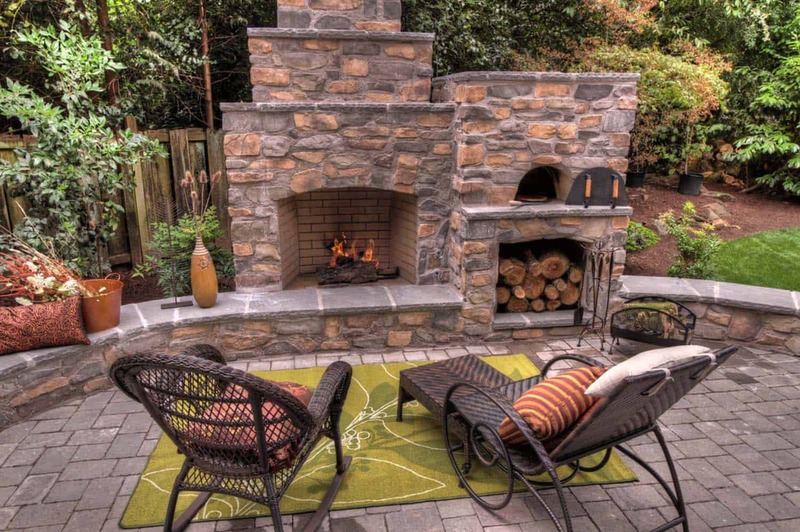 This outdoor living space in Washington D.C. offers its homeowners a three-season usage. 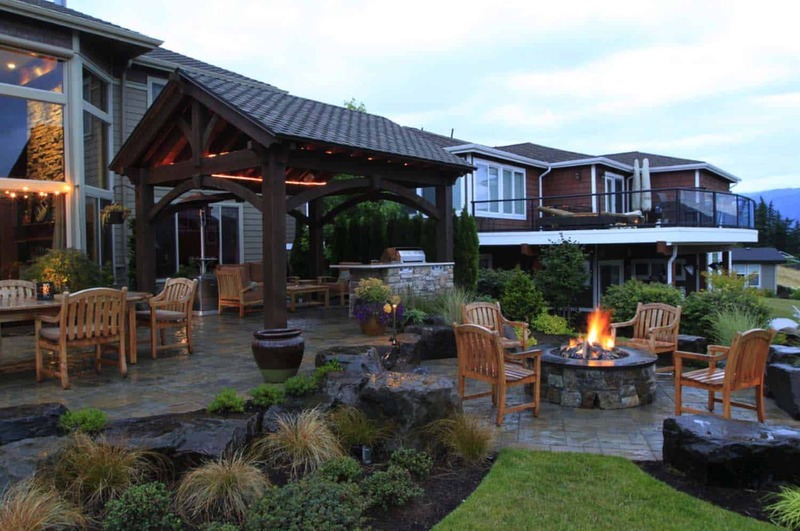 The added space is used for frequent gatherings and fundraisers they host. 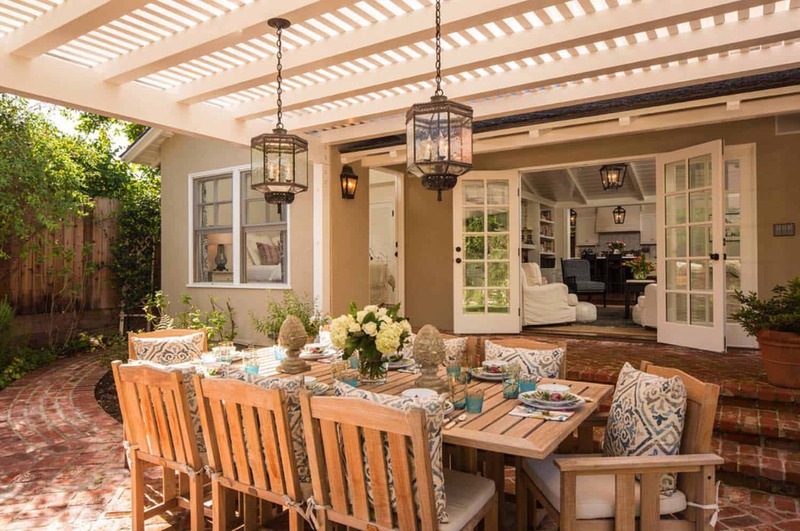 This lovely outdoor space was decorated in a neutral color schemata that matches with the hues used in the room adjacent to the patio. 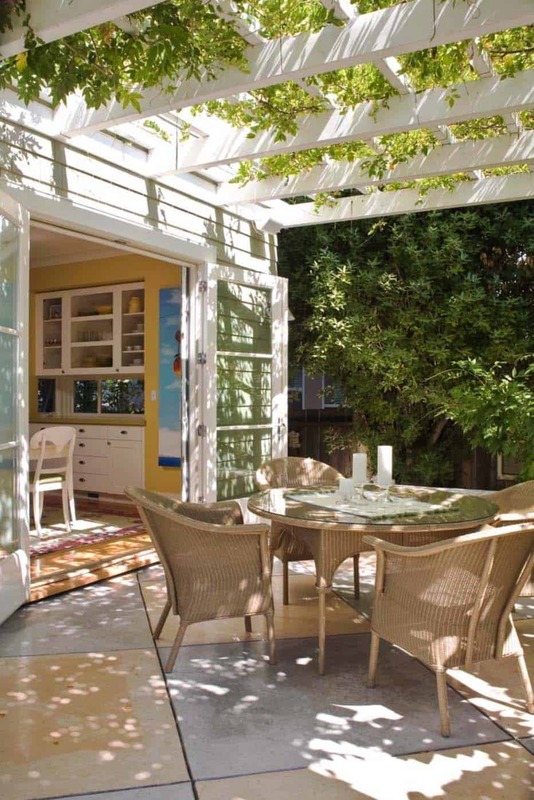 Several sets of French doors helps to blur the boundaries between indoors and out. 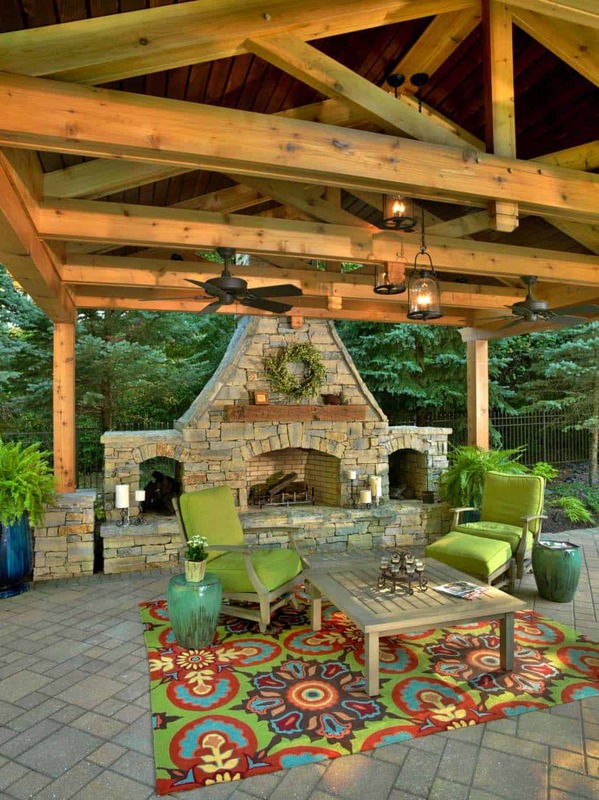 TIP: Personalize your outdoor living space with the addition of colorful artwork. 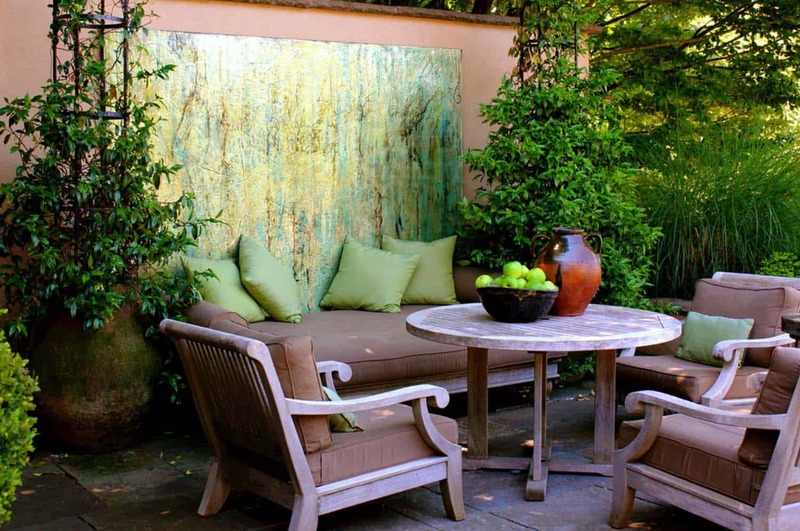 There are artists that make prints that are specifically designed for outdoor use. 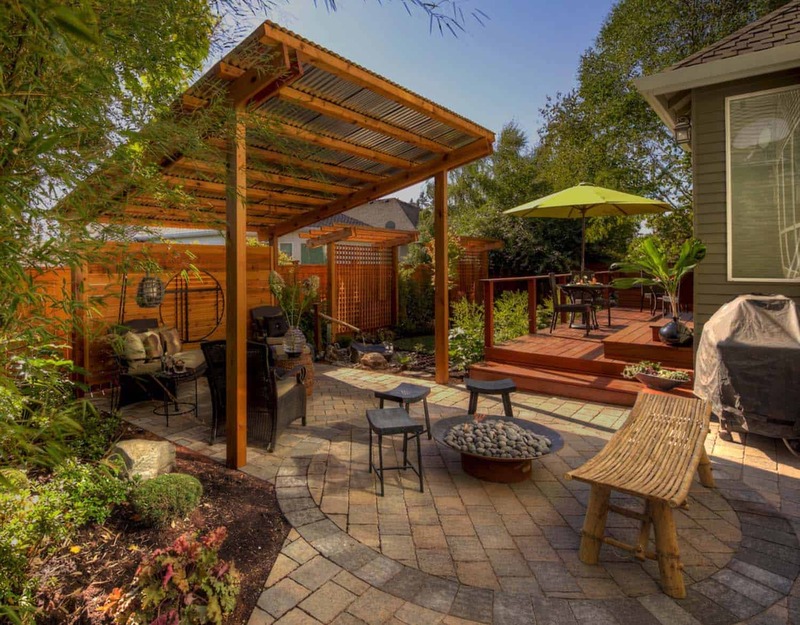 Above, a traditional outdoor patio in Richmond, Virginia features a comfortable gathering spot, a family refuge from the elements. 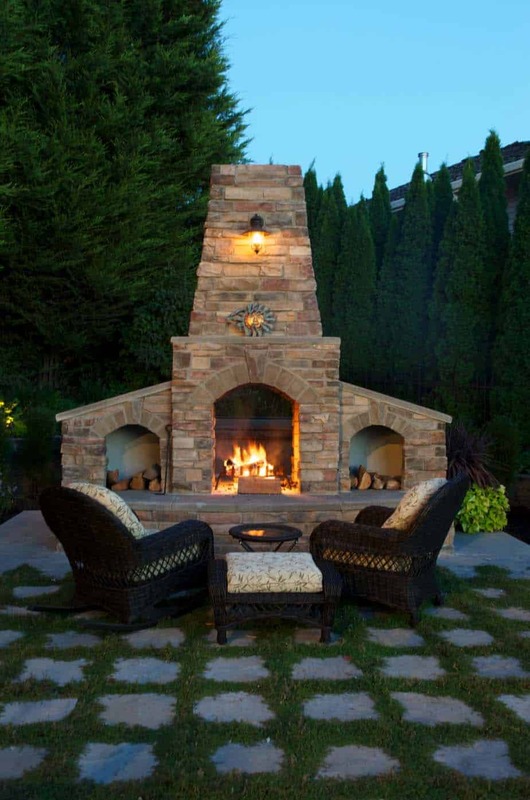 An outdoor fireplace was added to offer warmth during cooler temperatures. 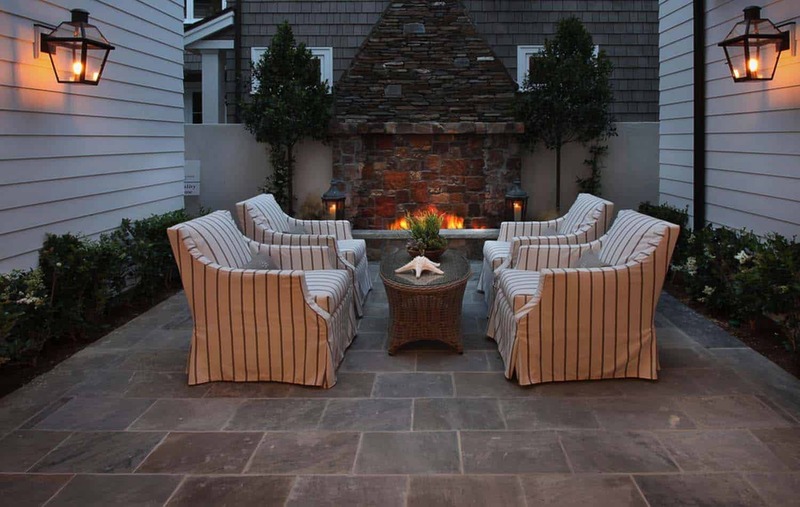 A continuous bluestone creates a seamless transition from the patio to the pool surround. 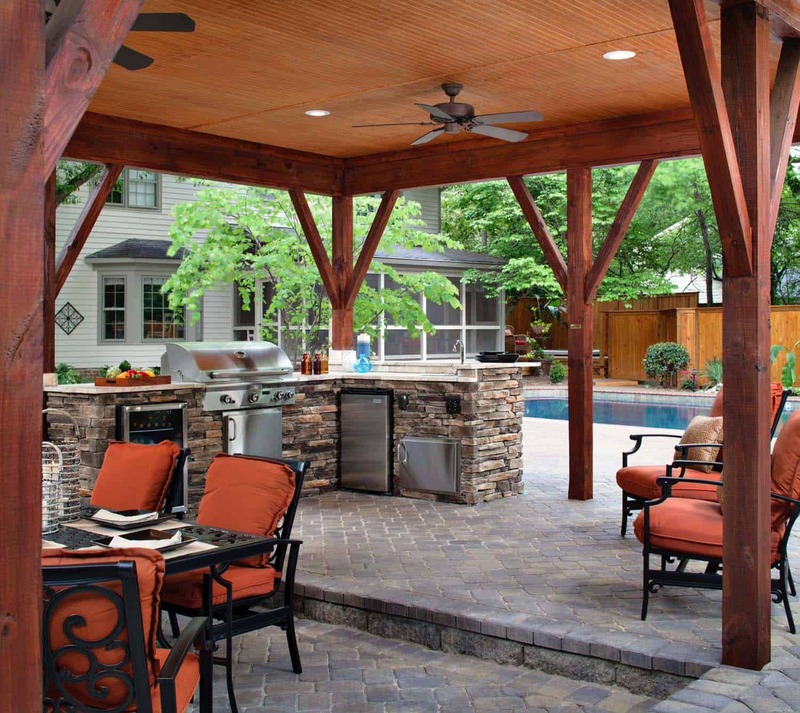 In Charleston, South Carolina, a traditional outdoor patio features a beautifully covered outdoor patio with a kitchen. 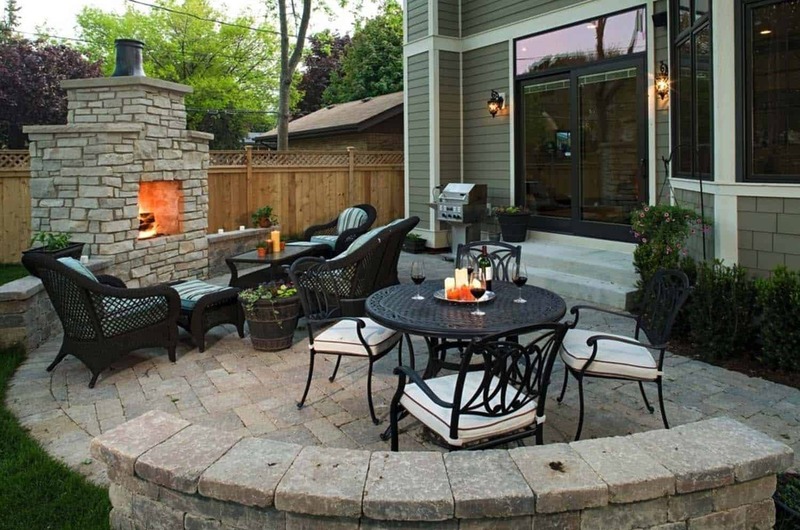 There is plenty of space for this family to entertain, relax and have a meal. 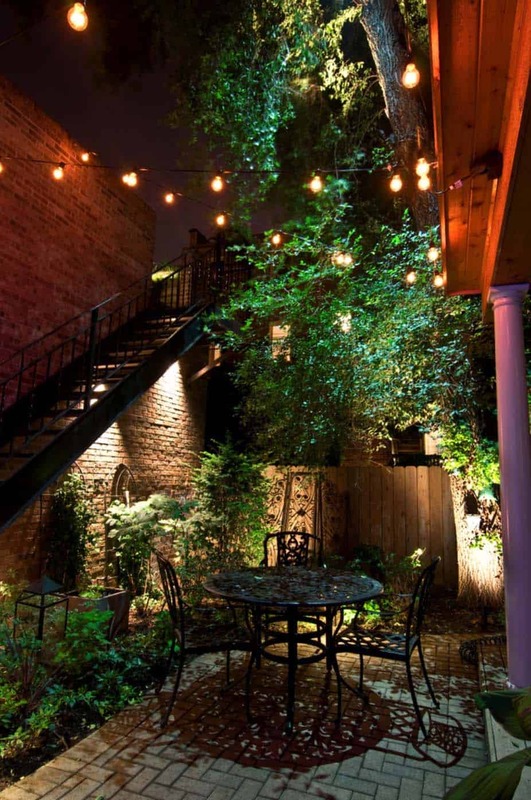 If you your traditional outdoor patio is narrow, possibly squeezed between two tall building like the image above; make use of the vertical space to hang string lights. 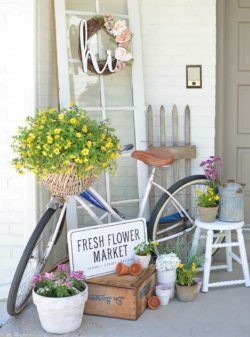 You will transform what would be found as a flaw into a charming feature. 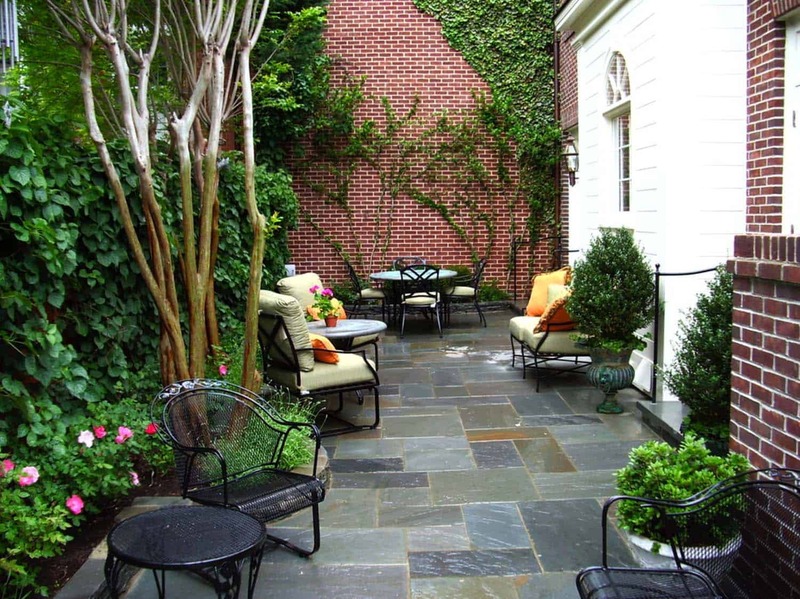 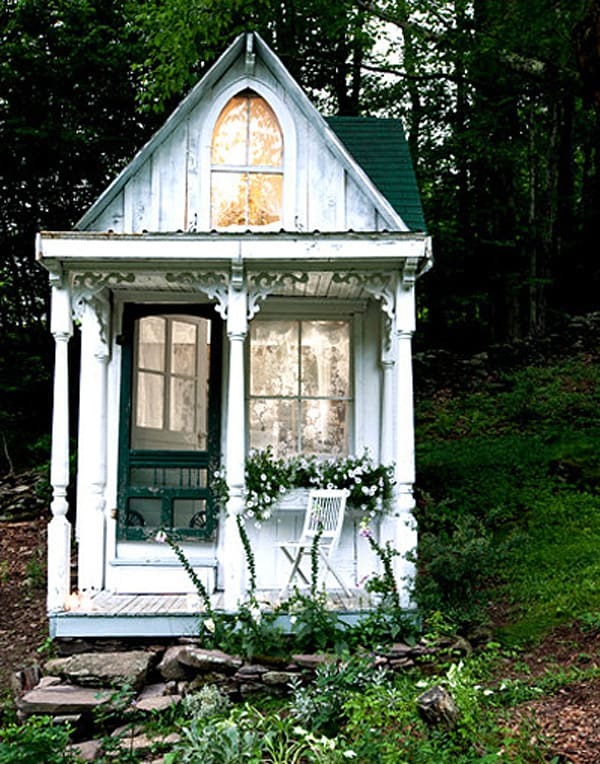 The same rule applies to a small interior space as with a small outdoor space. 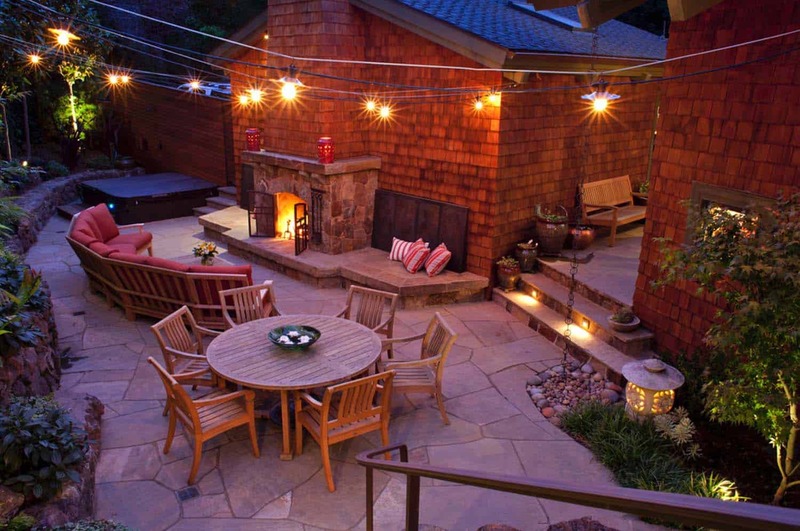 The more well lit the space is, the more spacious and welcoming it feels. 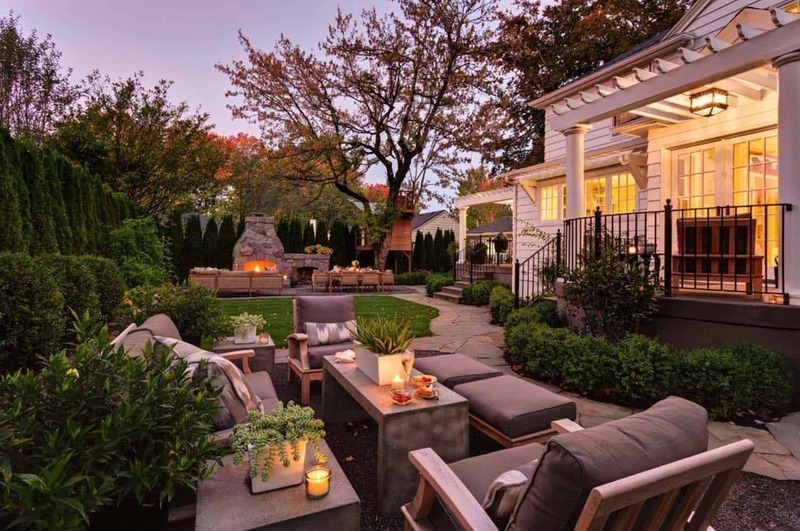 Consider the addition of landscape lighting to the plantings in the corners of your patio, this will help draw the eye to the edges of the space.